Good weather be praised, the spring season is mere days away and we're so excited. We are so happy to say goodbye to heavy snow boots and hello to boots like the Tibi Luca Boots. 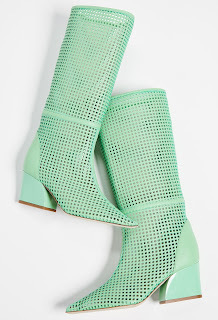 These mint green stunners boasts a perforated calfskin upper, pointed toe, and a 2 1/2" chunky heel with a rubber heel patch at the leather sole. Bring on the spring season because we are absolutely ready for it. Get these very high-end, luxury boots for $1,150.00 on www.shopbop.com.